A constitutional challenge in Papua New Guinea’s (PNG’s) National Court of Justice over the Manus Island detention camp has just begun. The challenge, brought by PNG Opposition leader Belden Namah, is being mounted on the grounds that it is unlawful to imprison anybody who has not been charged with a crime. Although a temporary injunction to prevent the Australian government sending any more asylum seekers to Manus was lost in the first few days of the case, this will have no impact on the challenge itself. Lawyers have also been granted access to the camp, a move that will further lift the veil of secrecy imposed on the camp. 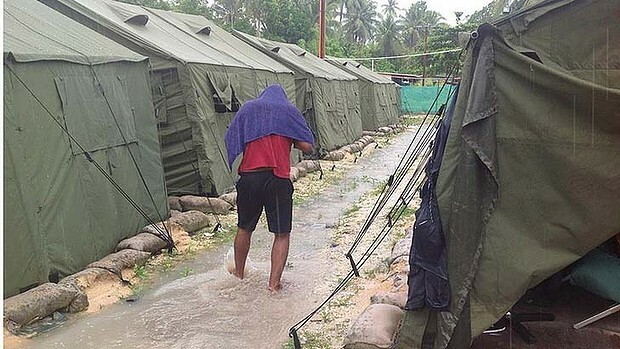 The case comes just after a scathing report on Manus Island by the United Nations High Commission for Refugees has proven activists’ concerns about the camp. Images released recently show that the camp is filthy and the tents where the single male asylum seekers are confined, are surrounded in water, creating a clear breeding ground for sickness and disease. The UNCHR report condemned the Manus Island camp and called for the immediate release of the 34 children presently held there. But, astonishingly, now former Immigration Minister Chris Bowen has insisted that, “The standard of the facilities and amenities in the temporary (centre) are in line with the living standards and amenities for local PNG residents on Manus Island.” This justifies nothing, but, if true, shows why the government should not be sending asylum seekers but should be providing aid to improve the living conditions on the island. Bowen also claimed that “Detainees have appropriate access to health, mental health, education and recreational services.” Yet one of the children has already been tested for suspected malaria. There are three pregnant Sri Lankan women who face giving birth in the camp in the coming months. And in another instance it took protests in the camp to get proper treatment for an Iranian man who is diabetic and has difficulty walking but who had been forced out of the medical centre by IHMS staff. Bottled water is now the only drinking water available and the first batch had to be collected after the bottles were found to be contaminated with sand. The electricity supply regularly fails and the camp is left without power for hours at a time. The UNHCR also highlighted the fact that although PNG is a signatory to the Refugee Convention, there is still no processing system in place to determine the asylum seekers’ claims. Nor is there any timeline for introducing one. The asylum seekers on Manus Island are in limbo, the same situation confronting the 410 asylum seekers languishing on Nauru. But the UNHCR stopped short of calling for the closure of Manus Island. Greens Senator Sarah Hanson-Young’s visit also brought to light the fact that UNHCR recognised refugees, some who had spent years waiting in Malaysia and Indonesia, were among those detained in the appalling conditions. No matter, according to the Immigration Department. Under Gillard’s “No advantage” test these internationally-recognised refugees could be detained for up to another five years. Manus Island and Nauru must be closed. The court case has the potential to close half of Julia Gillard’s Pacific Island hellholes. Yet Gillard is determined to draw more countries into her Pacific Solution; her latest shabby agreement is with the conservative New Zealand government, who have agreed to take 150 refugees from Australia a year. Disgracefully, the deal actually means New Zealand will cut its international resettlement places by 150. That’s 150 fewer places for UNHCR refugees in Indonesia who will left waiting for years longer. Meanwhile, Opposition leader Scott Morrison has again moved a private members’ bill to re-introduce temporary protection visas. At every turn, Gillard’s anti-refugee policies only serve to hand the political initiative to the Coalition to call for even more draconian policies. Gillard and Abbott are in a toxic embrace as they race to the bottom on refugees. It is a race Gillard can’t win. The only hope of stopping her dragging refugees and the rest of us down with her is to build the strongest possible refugee campaign to end both off shore processing and mandatory detention.